by Daniel A. McGrath Ph.D.
As data holdings get bigger and questions get harder, data scientists and analysts must focus on the systems, the tools and techniques, and the disciplined process to get the correct answer, quickly! Whether you work within industry or government, this book will provide you with a foundation to successfully and confidently process large amounts of quantitative data. What does quantitative analysis of a system really mean? What are big data and analytics? How do you know your numbers are good? What will the future data science environment look like? How do you determine data provenance? How do you gather and process information, and then organize, store, and synthesize it? How does an organization implement data analytics? Do you really need to think like a Chief Information Officer? What is the best way to protect data? What is the relationship between eating ice cream and getting attacked by a shark? The nine chapters in this book are arranged in three parts that address systems concepts in general, tools and techniques, and future trend topics. Systems concepts include contrasting open and closed systems, performing data mining and big data analysis, and gauging data quality. Tools and techniques include analyzing both continuous and discrete data, applying probability basics, and practicing quantitative analysis such as descriptive and inferential statistics. Future trends include leveraging the Internet of Everything, modeling Artificial Intelligence, and establishing a Data Analytics Support Office (DASO). Many examples are included that were generated using common software, such as Excel, Minitab, Tableau, SAS, and Crystal Ball. While words are good, examples can sometimes be a better teaching tool. For each example included, data files can be found on the companion website. Many of the data sets are tied to the global economy because they use data from shipping ports, air freight hubs, largest cities, and soccer teams. The appendices contain more detailed analysis including the 10 T's for Data Mining, Million Row Data Audit (MRDA) Processes, Analysis of Rainfall, and Simulation Models for Evaluating Traffic Flow. 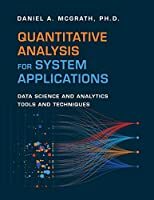 CHAPTER 1: What Does Quantitative Analysis of a System Really Mean? CHAPTER 4: Data Quality – How Do You Know Your Numbers Are Good? Author: Daniel A. McGrath Ph.D.